Western blot analysis of BxPC-3 cell extracts using Ron (C81H9) Rabbit mAb. 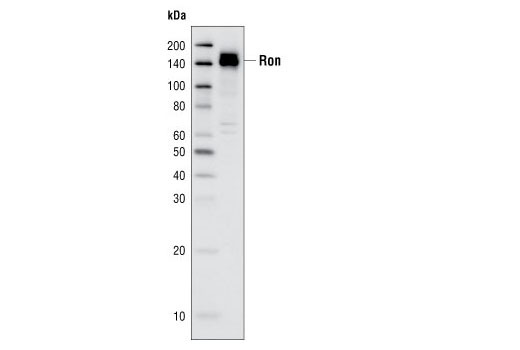 Ron (C81H9) Rabbit mAb detects endogenous levels of the β chain of Ron protein. This antibody does not cross-react with other family members. Monoclonal antibody is produced by immunizing animals with a synthetic peptide corresponding to residues surrounding Lys624 of human Ron. Ron is a member of the Met protooncogene family of receptor tyrosine kinases, which also includes Stk, c-Met, and c-Sea. The functional Ron is a heterodimer composed of a 40 kDa α chain and a 150 kDa β chain. Ron is initially synthesized in the cells as a single-chain, pro-Ron precursor that is cleaved into the two active chains. The α chain is completely extracellular, whereas the β chain traverses the cell membrane and contains the intracellular tyrosine kinase and regulatory elements (1,2). Ron mediates multiple signaling cascades that involve cell motility, adhesion, proliferation, and apoptosis. The signaling pathways activated downstream of Ron include the ras/mitogen-activated protein kinase (MAPK), phosphatidyl inositol-3 kinase (PI3K)/Akt, and focal adhesion kinase (FAK) pathways. Ron activation can also significantly increase c-Src activity, a signaling intermediate involved in cell cycle progression, motility, angiogenesis and survival (3,4). The function of Ron has been shown to be important for embryological development as well as implicated in the progression and metastasis of tumors (5). Ronsin, C. et al. (1993) Oncogene 8, 1195-202. Gaudino, G. et al. (1994) EMBO J 13, 3524-32. Wang, M.H. et al. (1996) Oncogene 13, 2167-75. Danilkovitch-Miagkova, A. (2003) Curr Cancer Drug Targets 3, 31-40. Leonard, E.J. (1997) Ciba Found Symp 212, 183-91; discussion 192-7.